Neurons receive synaptic inputs on extensive neurite arbors. How information is organized across arbors and how local processing in neurites contributes to circuit function is mostly unknown. Here, we used two-photon Ca2+ imaging to study visual processing in VGluT3-expressing amacrine cells (VG3-ACs) in the mouse retina. Contrast preferences (ON vs. OFF) varied across VG3-AC arbors depending on the laminar position of neurites, with ON responses preferring larger stimuli than OFF responses. Although arbors of neighboring cells overlap extensively, imaging population activity revealed continuous topographic maps of visual space in the VG3-AC plexus. All VG3-AC neurites responded strongly to object motion, but remained silent during global image motion. Thus, VG3-AC arbors limit vertical and lateral integration of contrast and location information, respectively. We propose that this local processing enables the dense VG3-AC plexus to contribute precise object motion signals to diverse targets without distorting target-specific contrast preferences and spatial receptive fields. Neurons receive most of their synaptic input on large intricately branched dendritic arborizations. Traditionally, distributed inputs were thought to be summed linearly at the cell body (Yuste, 2011). However, recent studies uncovered extensive local processing and clustered plasticity of synaptic inputs, which enhance the computational power of dendrites (Grienberger et al., 2015; Harvey and Svoboda, 2007; Kleindienst et al., 2011; London and Häusser, 2005; Losonczy et al., 2008). Although less studied, similar local processing occurs in terminal axon arbors, in which presynaptic inhibition and inhomogeneous distributions of voltage-gated ion channels can diversify the output of a single neuron (Debanne, 2004; Asari and Meister, 2012). Amacrine cells (ACs) are a diverse class of interneurons in the retina (Helmstaedter et al., 2013; MacNeil and Masland, 1998). Most of the approximately 50 AC types lack separate dendrites and axons and receive input and provide output through the same neurites (Diamond, 2017). Among the few AC types that have been studied in detail, starburst and A17 ACs are critical for direction selectivity and dim light signaling, respectively (Grimes et al., 2015; Amthor et al., 2002; Vlasits et al., 2014; Yonehara et al., 2016; Yoshida et al., 2001). The radially symmetric arbors of starburst ACs receive synaptic input and release neurotransmitters near and far from the soma, respectively (Ding et al., 2016; Vlasits et al., 2016). In a seminal study, Euler et al. (2002) discovered by two-photon Ca2+ imaging that the four to six primary neurites of starburst ACs with their daughter branches function as independent centrifugal motion sensors. Similarly, A17 ACs were shown to process converging inputs from rod bipolar cells separately (Grimes et al., 2010). For most AC types, however, whether arbors process inputs locally or integrate them globally and what specific stimulus features neurites encode remains unknown. As in most parts of the nervous system, synaptic communication in the retina occurs in dense neuropils in which arbors of neighboring cells overlap extensively (Helmstaedter et al., 2013). Population coding in sensory and motor systems has been studied at the level of cell bodies (Arnson and Holy, 2013; Churchland et al., 2012; Leonardo and Meister, 2013), but how cell-type-specific information is organized in population activity in neuropils has not been explored. VG3-AC neurites stratify broadly in the center of the inner plexiform layer (IPL) forming a dense plexus in which processes of approximately seven cells overlap at any point (Haverkamp and Wässle, 2004; Johnson et al., 2004; Kim et al., 2015). In somatic patch clamp recordings, VG3-ACs depolarize to light increments (ON) and decrements (OFF) restricted to their receptive field center, but hyperpolarize to large ON and OFF stimuli that include their receptive field surround (Kim et al., 2015; Lee et al., 2014; Grimes et al., 2011). 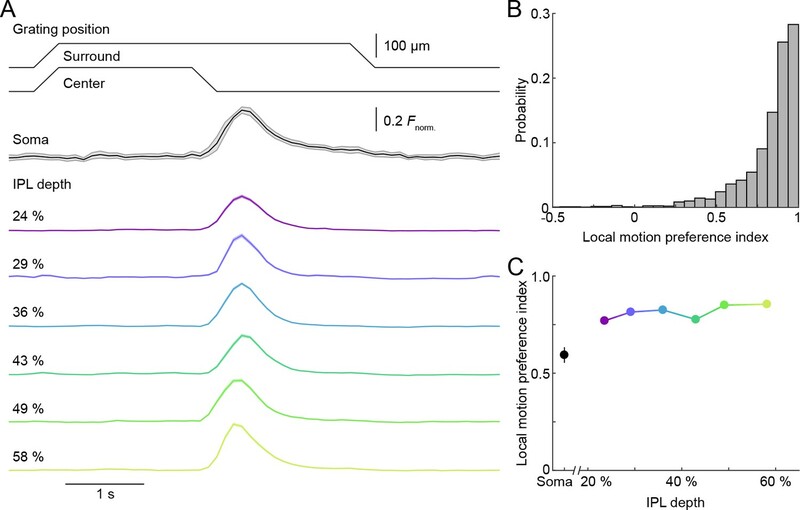 In addition, VG3-ACs depolarize strongly to local object motion but hyperpolarize during global image motion as occurs during eye movements (Kim et al., 2015). VG3-ACs are dual transmitter neurons. They provide glutamatergic input to a group of motion-sensitive retinal ganglion cell (RGC) types with diverse contrast and stimulus-size preferences (Krishnaswamy et al., 2015; Kim et al., 2015; Lee et al., 2014), and provide glycinergic input to Suppressed-by-Contrast RGCs (SbC-RGCs), inhibiting selectively responses to small OFF stimuli (Lee et al., 2016; Tien et al., 2016; Tien et al., 2015). Whether VG3-AC neurite arbors process inputs locally or integrate them globally, what stimulus features they encode, and how visual information is organized in the population activity of the VG3-AC plexus to support its varied circuit functions is unknown. Here, we used two-photon Ca2+ imaging in a novel transgenic mouse line to address these questions. We crossed VG3-Cre mice to a novel transgenic strain (Ai148) expressing the genetically encoded Ca2+ indicator GCaMP6f in a Cre-dependent manner enhanced by tTA-based transcriptional amplification. Staining for VGluT3 confirmed that GCaMP6f labeling in VG3-Cre:Ai148 retinas was mostly restricted to VG3-ACs (Figure 1—figure supplement 2) with sparse off-target expression in RGCs (Grimes et al., 2011; Kim et al., 2015). 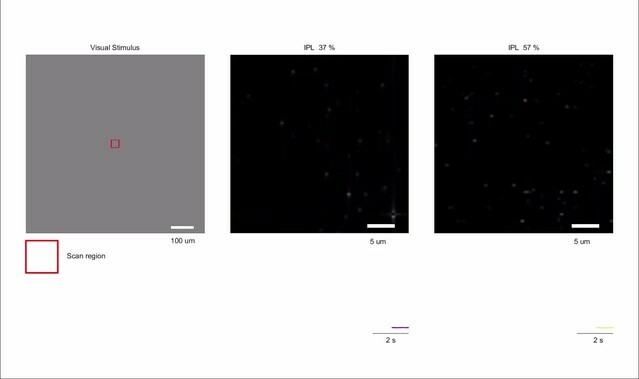 We imaged GCaMP6f signals in scan fields (33 × 33 μm for Figures 1, 2 and 4; 13 × 100 μm for Figure 3) in the IPL of flat-mounted retinas at 9.5 Hz with a pixel density of 4.7 pixels / μm2. 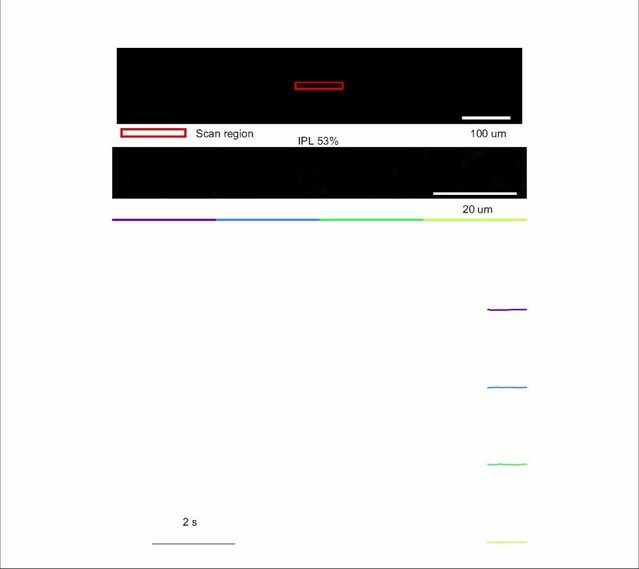 Recording depths of scan fields were registered by their relative distance to the outer and inner boundaries of the IPL (0–100%) detected by imaging transmitted laser light (Figure 1—figure supplement 2). Visual stimulation (385 nm) was spectrally separated from GCaMP6f imaging (excitation: 940 nm, peak emission: 515 nm); and recordings were obtained from the ventral retina, where S-opsin dominates (Haverkamp et al., 2005; Wang et al., 2011). To objectively identify processing domains of VG3-ACs neurites, we segmented images into functionally distinct regions of interest (ROIs) using a serial clustering procedure (Figure 1—figure supplement 1; s. Materials and methods). Contrast preferences of VG3-AC neurites shift across IPL depths. (A) Schematic of the VG3-AC circuit. VG3-AC neurites receive input from ON and OFF bipolar cells (ON and OFF BC) and synapse onto RGCs. (B) Ca2+ transients of ROIs at different imaging depth elicited by contrast steps in a small spot (diameter: 100 μm). A bar at the top indicates the stimulus timing. The black trace (shaded area) shows the mean (±SEM) responses of VG3-AC somata (n = 15). The six color-coded traces (shaded areas) indicate the mean (±SEM) responses of neurite ROIs at different IPL depths (21%: n = 673, purple; 29%: n = 972, blue; 37%: n = 817, sky; 44%: n = 1029, green; 51%: n = 1380, lime; 60%: n = 928, olive). (C, D) Distributions (C) and mean ± SEM (D) of polarity indices of VG3-AC neurite ROIs at different IPL depths color-coded as in (B). Polarity indices differed between IPL depths (p<10−16, Kruskal-Wallis one-way ANOVA). ROIs at 21% and 29% IPL depth were more biased to OFF responses than at other depths (p<10−4 compared to 37%; p<10−7 for 44–60%). ROIs from 51–60% IPL depth were more biased to ON than ROIs from 21–44% (p<10−7). No significant differences were observed between 21% and 29% (p=0.99) and between 51% and 60% (p=0.98). Even without image segmentation, using the average activity of each image plane a single data point, polarity indices differed across IPL depths (p<10−12, Kruskal-Wallis one-way ANOVA; 21%: n = 15; 29%: n = 18; 37%: n = 14; 44%: n = 16; 51%: n = 23; 60%: n = 20). (E) Lines show the distributions (i.e. skeleton densities) of axons of different OFF (BC1 – BC4) and ON (BC5t – BC7) bipolar cells types from 15–65% IPL depth, according to (Greene et al., 2016; Helmstaedter et al., 2013) (F) Representative image of a VG3-AC filled with Oregon Green BAPTA-1 via a patch-clamp pipette. (G, H) The average responses (±SEM, G) and polarity index distributions (H) of ROIs of a single VG3-AC at two IPL depths (34%: n = 50, blue; 47%: n = 59, green). (I) Depth-dependent shift in polarity indices (mean ±SEM) of neurite ROIs of two VG3-ACs filled with Oregon Green BAPTA-1 (depth-dependent differences within cells p<10−8 and p<0.05). ON and OFF responses in VG3-AC neurites differ in preferred stimulus size, but are equally transient. (A) Ca2+ responses of ROIs at different imaging depths to contrast steps in spots of different size. Spot diameters are noted above the bars indicating stimulus timing. The black traces (shaded areas) show the mean (±SEM) responses of VG3-AC somata (n = 8). The color-coded traces (shaded areas) indicate the mean (±SEM) responses of ROIs at different IPL depths (21%: n = 306, purple; 29%: n = 456, blue; 37%: n = 336, sky; 43%: n = 367, green; 50%: n = 700, lime; 60%: n = 588, olive). (B) The distributions of ON (white) and OFF (dark gray) receptive field center sizes of VG3-AC neurite ROIs. ON receptive field centers were larger than OFF receptive field centers (p<10−99, Wilcoxon rank sum test) (C) Receptive field center sizes (mean ±SEM) of ON (open circles) and OFF (filled circles) responses as a function of IPL depth. Because small response amplitudes led to rejection of >50% of ON responses of ROIs from 21–37% IPL depth (s. Material and methods), we restrict comparisons to 43–60% IPL depth. At all these depths, ON receptive field center sizes were larger than OFF receptive field center sizes (43%: p<10−8, 50%: p<10−9, 60%: p<10−9, Wilcoxon rank sum test with multiple comparison correction using the Benjamini–Hochberg procedure). Even without image segmentation, using the average activity of each image plane a single data point, ON receptive field centers were larger than OFF receptive field centers (p<10−3, Wilcoxon rank sum test, total: n = 61, 21%: n = 6; 29%: n = 13; 37%: n = 7; 43%: n = 6; 50%: n = 12; 60%: n = 17). (D) The distributions of transience indices of ON (white) and OFF (dark gray) responses of VG3-AC neurite ROIs did not differ significantly (p=0.925, Wilcoxon rank sum test). (E) Summary data (mean ± SEM) of transience indices of ON (open circle) and OFF (filled circle) responses as a function of IPL depth. Due to the high rejection rate of ON responses from 21 to 37% IPL depth, comparisons were restricted to 43–60% IPL depth. Transience indices of ON response is marginally lower than those of OFF responses at 43% (p<0.05), but were not significantly different at 50% (p=0.82) and 60% (p=0.05) IPL depth (Wilcoxon rank sum test with multiple comparison correction using the Benjamini–Hochberg procedure). We are not sure what accounts for the greater response transience observed in VG3-AC neurites vs. somata (p<10−4, Wilcoxon rank sum test). One possibility is that inhibitory synaptic inputs favor neurites and abbreviate responses. Population activity of the VG3-AC plexus encodes spatial information with high precision. (A) Schematic of visual stimulus. Vertical bars (height: 60–80 μm, height: 50 μm width) were presented at 17 different positions along the horizontal axis of a rectangular imaging region (height: 13 μm, width: 100 μm). Stimulus positions were symmetric around the center of the imaging region and spaced by 25 μm center-center distances from −150 μm to 150 μm. In addition, bars were presented −400 μm, −200 μm, 200 μm, and 400 μm from the center of the imaging region. Each bar was presented three for 1.5 s with an interval of 1.5 s between stimuli. The order of stimulus positions was randomized and each stimulus repeated three times. (B) Heatmap of normalized responses in VG3-AC neurites to bars stimuli from −150 μm to 100 μm from the center of the imaging region at an IPL depth of 53%. Responses have been reordered by stimulus positions. Each row of the heatmap represents the activity a single pixel. Pixels were sorted by their distance from the center of the imaging region (−50 μm to 50 μm). (C) Representative images of the VG3-AC plexus in the scan region obtained by averaging the GCaMP6f signal over (left: IPL depth 36%, right: IPL depth 53%). (D) Maps of receptive field positions in the same regions of the VG3-AC plexus shown in (C) (left: OFF responses, right: ON responses). (E) Distributions of receptive field positions of pixels in four adjacent subsections (color-coded from left to right in: purple, sky, lime, and olive) of the scan regions shown in (C) and (D). Receptive field positions of the pixels of each image were aligned to zero their average. (F, H) The accuracy with which a naive Bayes classifier can assign the location of a VG3-AC neurite pixel based on its receptive field position to one of two image subsections increases as a function of the distance between these subsections (solid lines). Dashed lines shows the accuracy when classifiers were trained on shuffled receptive field positions. (G, I) The minimum separable distance (i.e. the point at which prediction accuracy reaches 75%) decreased when predictions were based on multiple pixels (e.g. median ROI size in VG3-AC neurites: 10 pixels). Uniform local motion preference of VG3-AC neurites. (A) Schematic at the top shows the time course of the grating motion in the receptive field center and surround (s. Video 2, and Materials and methods). The black trace (shaded area) shows the mean (±SEM) responses of VG3-AC somata (n = 11). The color-coded traces (shaded areas) indicate the mean (±SEM) responses of ROIs at different IPL depths (24%: n = 388, purple; 29%: n = 202, blue; 36%: n = 500, sky; 43%: n = 322, green; 49%: n = 308, lime; 58%: n = 298, olive). (B) The distribution of local motion preference indices of all ROIs. (C) Summary data (mean ± SEM) of local motion preference indices as a function of IPL depth. Local motion preference indices did not differ across IPL depths (p=0.09, Kruskal-Wallis one-way ANOVA). No ROI group at any depth was significantly different from any ROI group at another depth. In somatic patch clamp recordings, VG3-ACs depolarize to small ON and OFF stimuli (Lee et al., 2014; Kim et al., 2015; Grimes et al., 2011). Somatic Ca2+ transients exhibited similar ON-OFF profiles (Figure 1A and B). To test how ON and OFF responses are distributed across VG3-AC arbors, we recorded Ca2+ transients elicited by contrast steps in a small spot (diameter: 100 μm) at different depths of the IPL (Figure 1B and Video 1). We quantified contrast preferences by a polarity index, ranging from −1 for pure OFF responses to 1 for pure ON responses (see Materials and methods). Polarity indices varied widely between ROIs (n = 5814, n = 11 mice). The distribution of polarity indices shifted with IPL depth, as neurites in the outer IPL (depths < 40%) responded more strongly to OFF stimuli, and neurites in the inner IPL (depths > 40%) responded more strongly to ON stimuli (Figure 1C,D). To make sure that the sparse off-target expression of GCaMP6f in RGCs did not contribute significantly to these results, we imaged signals in the IPL of VG3-Cre:Ai148 mice 3 weeks after optic nerve crush, which removes most RGCs but not ACs (Park et al., 2008). Distributions of polarity indices measured in these experiments recapitulated the depth-dependent shift in contrast preferences observed in control retinas (Figure 1—figure supplement 3). Because the arbors of each VG3-AC span the depth of the VG3-AC plexus (Grimes et al., 2011; Kim et al., 2015; Lee et al., 2014), it seemed unlikely that the shift in contrast preferences reflected differences between cells. Nonetheless, we imaged Ca2+ transients in two VG3-ACs filled with Oregon Green BAPTA-1, confirming that polarity indices shift within arbors of single cells (Figure 1F–I). The ratio of ON and OFF signals across VG3-AC arbors closely followed stratification patterns of ON and OFF bipolar cell axons in the IPL (Figure 1E) (Helmstaedter et al., 2013; Franke et al., 2017; Greene et al., 2016). However, response polarities of VG3-AC neurites were less extreme than those reported for bipolar cell axons (Borghuis et al., 2013; Franke et al., 2017). 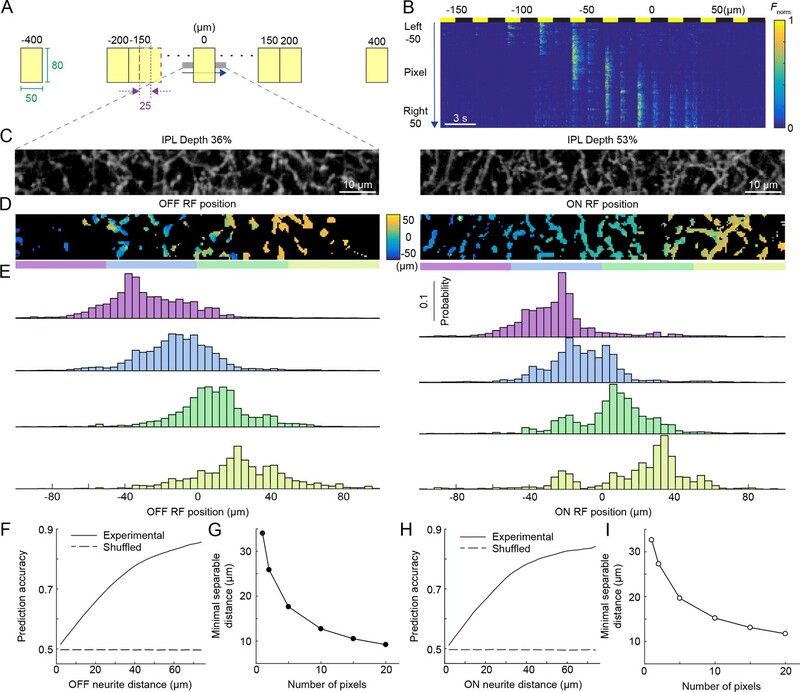 This suggests that local bipolar cell innervation patterns and restricted postsynaptic signal (voltage and/or Ca2+) spread determine contrast preferences of VG3-AC neurites and limit vertical integration of visual information in their arbors. Ca2+imaging of VG3-AC neurite responses to contrast steps in spots of varying size recorded at different IPL depths. Image series of GCaMP6f responses at 24% (middle) and 53% (right) IPL depth to contrast steps in spots of different size (left). The video is sped up 2.5-fold relative to the image acquisition. In the left panel, the area of the scan fields is indicated by a red box. Two average normalized ROI traces are shown at the bottom of the middle and the right panel. A hallmark of VG3-ACs’ somatic voltage responses is strong size selectivity (Lee et al., 2014; Kim and Kerschensteiner, 2017; Kim et al., 2015). 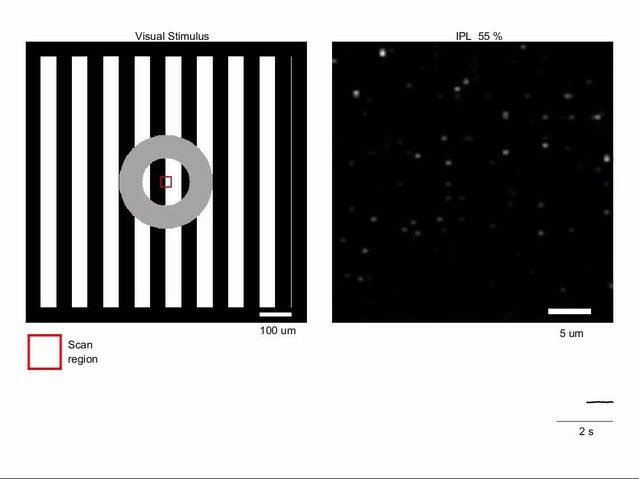 We therefore explored how VG3-AC neurites respond to contrast steps in spots of different sizes (Figure 2A and Video 1). The depth-dependent shift in contrast preferences of VG3-AC neurites observed for 100 μm spots persisted when we calculated polarity indices based on responses to all stimulus sizes (Figure 2—figure supplement 1). At all depths, only small stimuli (diameter <400 μm) elicited Ca2+ transients in VG3-AC neurites (Figure 2A and Video 1) and size-selectivity indices of ROIs were uniformly high (Figure 2—figure supplement 2), indicating that receptive field surrounds are strong across VG3-AC arbors. To measure ON and OFF receptive field centers, we estimated optimal stimulus sizes for each ROI using a template-matching algorithm (see Materials and methods). ON receptive field centers of VG3-AC neurites were consistently larger than OFF receptive field centers, independent of IPL depth (Figure 2A–C). This could be due to larger dendritic territories of the ON compared to the OFF bipolar cells that provide input to VG3-ACs (Behrens et al., 2016), and/or the fact that ON but not OFF bipolar cell axons are gap junctionally coupled to AII ACs (Marc et al., 2014; Demb and Singer, 2015; Bloomfield and Völgyi, 2009). Both ON and OFF receptive field centers were smaller than VG3-AC arbors and only slightly larger than bipolar cell receptive field centers (Franke et al., 2017; Schwartz et al., 2012; Purgert and Lukasiewicz, 2015), supporting the notion that local input from a small number of bipolar cells shapes spatial receptive fields of VG3-AC neurites with limited lateral integration of visual information in their arbors. In contrast to differences in their spatial tuning, ON and OFF responses were equally transient across VG3-AC arbors (Figure 2A,D,E). By increasing our scan rate from 9.5 Hz to 37.9 Hz, we confirmed that our measurements of response transience were not limited by the image acquisition rate (Figure 2—figure supplement 3). At any point of the VG3-AC plexus, arbors from approximately seven cells overlap (Kim et al., 2015). To explore how spatial information is encoded by population activity in this plexus, we imaged rectangular regions (height: 13 μm, width: 100 μm) in the IPL of VG3-Cre:Ai148 mice while presenting vertically oriented bars (height: 60–80 μm, width: 50 μm) at different positions (interval: 25 μm, range: 800 μm) along the horizontal axis of the imaging region. We presented each bar for 1.5 s with an interval of 1.5 s between subsequent stimuli. Bars were shown in random sequences and responses reordered by stimulus positions in Figure 3A and Video 2. We analyzed ON and OFF responses separately, but combined data from different IPL depths, which did not differ in their spatial coding (Figure 2). For each pixel, we determined receptive field positions along the horizontal stimulus axis (Figure 3B; see Materials and methods). This revealed continuous topographic maps of visual space in the VG3-AC plexus (Figure 3C,D). To quantify the precision of these maps, we calculated the accuracy with which naive Bayes classifiers could assign neurite activity to specific parts of the map based on receptive field positions (see Materials and methods). Even for single pixels, this accuracy was remarkably high (Figure 3E,F,H); and the minimal distance at which different regions of the map could be distinguished with >75% accuracy (i.e. minimal separable distance) decreased further when considering that multiple pixels represent the activity of VG3-AC neurite processing domains (median number of pixels per ROI: 10, Figure 3G,I). Thus, local processing generates precise topographic maps of visual space in the population activity of the dense VG3-AC plexus. Ca2+imaging of VG3-AC neurite responses to white bar at different distance from the center. Image series of GCaMP6f responses at 53% IPL depth to a vertical stimulus bar (1.5 s ON, 1.5 s OFF) presented at different positions along the horizontal axis of the imaging region. The video is sped up 2.5-fold relative to the image acquisition. The scan field is indicated by a red box. Normalized response traces of pixels from four different parts of scan field are shown at the bottom, color-coded according to the bar beneath the scan field. VG3-ACs participate in object-motion-sensitive circuits in the retina (Krishnaswamy et al., 2015; Kim et al., 2015; Kim and Kerschensteiner, 2017). We tested the ability of individual VG3-AC neurites to distinguish local and global image motion, using a stimulus in which square wave gratings overlaying center and surround regions of receptive fields moved separately or together (Kim et al., 2015; Olveczky et al., 2003; Zhang et al., 2012). At all IPL depths, isolated motion of the center grating elicited robust Ca2+ transients in VG3-AC neurites, which remained silent during simultaneous motion of gratings in center and surround (i.e. global motion) (Figure 4A, Figure 4—figure supplement 1, and Video 3). As a result, local motion preference indices (see Materials and methods) of >70% of ROIs were >0.8 (Figure 4B,C). Thus, in spite of the diversity of responses to contrast steps, VG3-AC neurites exhibit uniform object motion sensitivity. Ca2+imaging of VG3-AC neurite responses to motion. Image series of GCaMP6f responses at 55% IPL depth (right) to synchronous or isolated motion of square wave gratings in the center and surround separated by a gray annulus (left). The video is sped up 1.25-fold relative to the image acquisition. In the left panel, the area of the scan fields is indicated by a red box. The average normalized ROI trace is shown at the bottom of the right panel. How does local processing in neurites of VG3-ACs contribute to their circuit function? VG3-ACs provide glutamatergic input to W3-RGCs, which detect movements in a small area of visual space closely aligned with their dendrites (Kim et al., 2015; Zhang et al., 2012). Input from VG3-ACs is required for normal object-motion-sensitive responses of W3-RGCs (Kim et al., 2015). If VG3-ACs integrated visual information globally, excitatory receptive fields of W3-RGCs would expand considerably, lowering the precision with which the position of moving objects could be inferred from their activity (Jacoby and Schwartz, 2017). In addition to W3-RGCs, VG3-ACs provide excitatory input to ON direction-selective ganglion cells (ON DSGCs), ON-OFF DSGCs and OFFα-RGCs (Lee et al., 2014; Krishnaswamy et al., 2015). These motion-sensitive RGC types differ in their preferred stimulus contrast and stratify dendrites at different depths of the IPL. The depth-dependent shift in contrast preferences across neurite arbors likely enables VG3-ACs to contribute motion-sensitive excitatory input to ON DSGCs, ON-OFF DSGCs, and OFFα-RGCs without altering the diverse contrast preference of these targets. VG3-ACs also provide glycinergic input to SbC-RGCs (Tien et al., 2016; Tien et al., 2015; Lee et al., 2016). Whether VG3-ACs release glutamate and glycine from different sites in their arbor and how these sites differ in their visual information remains to be determined. Nonetheless, when VG3-ACs were removed from the retina, inhibitory input to SbC-RGCs was reduced for OFF but not ON stimuli (Tien et al., 2016). The local processing of ON and OFF signals we observe in VG3-AC arbors could help explain this selective deficit. Finally, we find that, because of local processing, population activity in the VG3-AC plexus reflects local presynaptic input patterns rather than postsynaptic identity and represents visual space in remarkably precise continuous topographic maps. Thus, local processing enables the dense VG3-AC plexus to contribute precise and uniformly selective object motion signals to diverse targets without distorting target-specific contrast preferences and spatial receptive fields. We crossed VG3-Cre mice, in which Cre recombinase is expressed from a bacterial artificial chromosome (BAC) containing regulatory sequences of the Slc17a8 gene encoding VGluT3, provided by Dr. R.H. Edwards (Grimes et al., 2011) to the Ai148 strain, a novel transgenic line made by first targeting a Flp/Frt-based docking site cassette into the TIGRE locus on chromosome 9, followed by modification of that locus by Flp-induced RMCE. Ai148 mice contain Cre-regulated units within the TIGRE locus (Madisen et al., 2015) for both GCaMP6f and tTA2 expression, thereby allowing for tTA-based transcriptional amplification of GCaMP6f in a two mouse system. To allow targeting of VG3-ACs under two-photon guidance for filling with Oregon Green BAPTA-1, we crossed VG3-Cre mice to the Ai9 tdTomato reporter strain (Madisen et al., 2010). Mice were housed in a 12 hr light/dark cycle and fed ad libidum. We isolated retinas from mice of both sexes aged between postnatal day 30 (P30) and P45. All procedures in this study were approved by the Institutional Animal Care and Use Committee of Washington University School of Medicine (Protocol # 20170033) and were performed in compliance with the National Institutes of Health Guide for the Care and Use of Laboratory Animals. Mice (P30) were anesthetized with a mixture of ketamine (100 mg/kg) and xylene (10 mg/kg). The optic nerve was exposed intraorbitally and crushed with forceps (Dumont #55 FST, Foster City, CA) for ~10 s~1 mm behind the posterior surface of the eyeball. At the end of surgery, a drop of 0.5% proparacaine hydrochloride ophthalmic solution was administered for pain control, and Melocxican SR (4 mg/Kg) was injected s.c. immediately and 24 hr after surgery. Triple antibiotic ointment (Actavis, Dublin, Ireland) was applied to the cornea for infection prophylaxis. Mice were dark-adapted for more than 1 hr, deeply anesthetized with CO2, killed by cervical dislocation, and enucleated. Retinas were isolated under infrared illumination in mouse artificial cerebrospinal fluid buffered with HEPES (mACSFHEPES for immunohistochemistry) or sodium bicarbonate (mACSFNaHCO3 for two-photon imaging). mACSFHEPES contained (in mM): 119 NaCl, 2.5 KCl, 2.5 CaCl2, 1.3 MgCl2, 1 NaH2PO4, 11 glucose and 20 HEPES (pH adjusted to 7.37 with NaOH). mACSFNaHCO3 contained (in mM) 125 NaCl, 2.5 KCl, 1 MgCl2, 1.25 NaH2PO4, 2 CaCl2, 20 glucose, 26 NaHCO3 and 0.5 L-Glutamine equilibrated with 95% O2/5% CO2. Isolated retinas were flat mounted on black membrane disks (HABGO1300, MilliporeSigma, Burlington, MA, for immunohistochemistry) or transparent membrane discs (Anodisc 13, Whatman, Maidstone, UK, for two-photon imaging). Flat-mounted retinas were fixed for 30 min in 4% paraformaldehyde in mACSFHEPES at room temperature (RT) and washed three times for 10 min in PBS at RT. The fixed tissue was cryoprotected with incubations in 10%, 20%, and 30% sucrose in PBS for 1 hr at RT, 1 hr at RT, and overnight at 4°C, respectively, followed by three cycles of freezing (held over liquid nitrogen) and thawing (in 30% sucrose in PBS). Retinas were then washed three times in PBS for 1 hr at RT, and stained for VGluT3 (rabbit anti-VGluT3, Cat. No. 1352503, Synaptic Systems, Göttingen, Germany) and GFP (chicken anti-GFP, 1:1000, Cat. No. A10262, ThermoFisher, Waltham, MA) for 3 to 5 days at 4°C in PBS with 5% normal donkey serum and 0.5% Triton X-100. Subsequently, retinas were washed three times for 1 hr in PBS, stained with Alexa 488- Alexa 568-conjugated secondary antibodies (Invitrogen, Carlsbad, CA, 1:1000) overnight at 4°C, washed three times in PBS for 1 hr, and mounted in Vectashield mounting medium (Vector Laboratories, Burlingame, CA) for confocal imaging. Confocal image stacks of fixed tissue were acquired through 20 × 0.85 NA or 60 × 1.35 NA oil immersion objectives (Olympus, Tokyo, Japan) on an upright microscope (FV1000, Olympus). Confocal images were processed and analyzed with Fiji (Schindelin et al., 2012). Visual stimuli were written in MATLAB (The Mathworks, Natick, MA) using the Cogent Graphics toolbox (John Romaya, Laboratory of Neurobiology at the Wellcome Department of Imaging Neuroscience, University College London, UK). Stimuli were presented from a UV E4500 MKII PLUS II projector illuminated by a 385 nm LED (EKB Technologies, Bat-Yam, Israel) and focused onto the photoreceptors of the ventral retina via a substage condenser of an upright two-photon microscope (Scientifica, Uckfield, UK). All stimuli were centered on the two-photon scan field and their average intensity was kept constant at ~1600 s-opsin isomerizations/S cone/s. To test contrast preferences, receptive field sizes, and response transience, the intensity of spots of varying diameter (20, 50, 76, 100, 150, 200, 400, and 800 μm) was square-wave-modulated (1.5 s ON, 1.5 s OFF) for five cycles. The order in which spots of different size were presented was randomly chosen for each scan field. To probe the distribution of receptive field positions in the VG3-AC plexus, vertical bars (height: 60–80 μm, width: 50 μm) were presented at different positions (interval: 25 μm, range: 800 μm) along the horizontal axis of a rectangular imaging region (height: 13 μm, width: 100 μm). To compare responses to local vs. global motion stimuli, narrow square wave gratings (bar width: 50 μm) over the receptive field center (diameter: 150 μm) and surround (150–800 μm from center of the image) were moved separately or in unison (Kim et al., 2015; Zhang et al., 2012). A gray annulus was included in the spatial layout of the stimulus to reliably separate movement in the center and surround. Each grating motion lasted 0.5 s, and movements were separated by 1.5 s.
A custom-built upright two-photon microscope (Scientifica) controlled by the Scanimage r3.8 MATLAB toolbox was used in this study; and images were acquired via a DAQ NI PCI6110 data acquisition board (National Instruments, Austin, TX). GCaMP6f and Oregon Green BAPTA-1 were excited with a Mai-Tai laser (Spectra-Physics, Santa Clara, CA) tuned to 940 nm, and fluorescence emission was collected via a 60 × 1.0 NA water immersion objective (Olympus) filtered through consecutive 450 nm long-pass (Thorlabs, Newton, NJ) and 513–528 nm band-pass filters (Chroma, Bellows Falls, VT). This blocked visual stimulus light (peak: 385 nm) from reaching the PMT. We compared imaging GCaMP6f signals at higher pixel density (4.7 pixels / μm2) and lower scan rate (9.5 Hz), to imaging at lower pixel density (0.85 pixels / μm2) and higher scan rate (37.9 Hz). Because image segmentation was more reliable at the higher pixel density and measurements of response transience were indistinguishable between both scan rates (Figure 2—figure supplement 3), we acquired images throughout this study at 9.5 Hz with a pixel density of 4.7 pixels / μm2. Imaging depths were registered by their relative distances to the borders between the IPL and the inner nuclear layer (IPL depth: 0%) and between the IPL and the ganglion cell layer (IPL depth: 100%). Borders were detected in transmitted light images (Figure 1—figure supplement 2). Scan fields at different IPL depths were imaged in pseudorandom order, and for each scan, the retina was allowed to adapt to the laser light for 30 s before presentation of visual stimuli. All images were acquired from the ventral retina, where S-opsin dominates (Wang et al., 2011; Haverkamp et al., 2005). Throughout the experiments, retinas were perfused at ~7 mL/min with 34°C mACSFNaHCO3 equilibrated with 95% O2/5% CO2. Single VG3-ACs were filled with Oregon Green BAPTA-1 via a patch-clamp electrode in VG3-Cre Ai9 mice (Kim et al., 2015). The intracellular solution contained (in mM): 116 D-gluconic acid (potassium salt), 2 NaCl, 6 KCl, 4 adenosine 5’-triphosphate (magnesium salt), 0.3 guanosine 5’-triphosphate (sodium salt), 20 HEPES, 10 phosphocreatine (disodium salt), 0.15 Oregon Green 488 BAPTA-1. The pH of this solution was adjusted to 7.25 with KOH. Transmitted light images were acquired simultaneously with fluorescence images and were used to detect z-axis displacements that resulted in rejection of the respective image series. Images of series without z-axis displacements were registered to the middle frame using built-in functions in MATLAB. Rigid transformations were applied to both transmitted and fluorescence images. The quality of registration was confirmed by visual inspection, before transformed fluorescence images were used for further image processing and analysis. Time series of each pixel were searched for outliers (>10 SD). If outliers were isolated in time (i.e. pixel value before and after outlier <10 SD), they were replaced with the average of the value before and after the outlier. This algorithm effectively removed PMT shot noise. To identify functional processing domains in VG3-AC neurites with minimal assumptions and user involvement, we developed a serial clustering procedure, in which a functional clustering algorithm is successively applied to different image features. This procedure removed pixels of the image not responding to visual stimulation and automatically assigned responsive pixels to functionally coherent, spatially contiguous regions of interest (ROIs). The functional clustering algorithm was based on Shekhar et al. (2016), beginning with principal components analysis to reduce the dimensionality of the input feature to the minimum needed to explain 80% of its variance. This was followed by a K-nearest-neighbor (KNN) algorithm, which generated a connectivity matrix. The connectivity matrix was then used in community detection clustering (Le Martelot and Hankin, 2013). We first applied functional clustering to the raw data of an image series and removed low-intensity pixels. Signals of remaining pixels were normalized to their peak and fed back into the functional clustering algorithm to group pixels with similar response properties. Groups of functionally similar pixels were divided into spatially contiguous ROIs within the image. The average response traces of these ROIs were subjected to further rounds of functional clustering, in which spatially adjacent ROIs that were grouped in the same cluster were merged. This process was repeated until it converged on a stable solution (typically less than 15 iterations). Finally, ROIs identified in this procedure were examined for signal correlation with the visual stimulus and size, to reject non-responsive and/or small (<5 pixels) ROIs. To explore encoding of spatial information in the VG3-AC plexus (Figure 3), we analyzed distributions of receptive field positions on a pixel-by-pixel basis rather than by ROIs. For this analysis, image series were 2-D median filtered (3 × 3 pixel kernel), and pixels whose standard deviation was in the lower 25% of all pixels were excluded. To detrend signals from Oregon Green BAPTA-1 imaging, we removed low-frequency fluctuations by ensemble empirical mode decomposition (EEMD) of each ROI (Wang et al., 2014). Parameters were set to the following values for EEMD: noise level = 0.1, ensemble number = 100, number of prescribed intrinsic mode functions = 10. A polarity index of 1 indicates pure ON responses, whereas a polarity index of −1 indicates pure OFF responses. To confirm that the observed depth-dependent shift in contrast preferences across VG3-AC arbors was not restricted to a specific stimulus size, we alternatively calculated polarity indices using average responses for all stimulus sizes (diameter: 20–800 μm, Figure 2—figure supplement 1). ON and OFF periods each lasted 1.5 s. tpeak is the time to peak, measured from stimulus onset, and α is a delay set to the fourth frame (~420 ms) after the peak frame. Because response transience was weakly correlated with response amplitude (R2 = 0.0187, p<10−34, n = 3631 ROIs), we corrected transience indices by linear regression and rejected responses to ON or OFF stimuli if their maximal amplitude was <25% of the OFF or ON responses of the same ROI, respectively. A corrected maximal transience index of 1.15 indicates that the GCaMP6f signal returned to baseline at time α after the peak. Consistent with previous studies (Crook et al., 2008), we defined receptive field center size as equivalent to the stimulus size eliciting the maximal response (Figure 2). We used a template-fitting algorithm to measure the receptive field center size of each ROI. For each ROI (i.e. target), normalized stimulus-size-response functions of 20 other randomly chosen ROIs (i.e. templates) were scaled and shifted along the x-axis to best fit its own normalized stimulus-size-response. To increase the reliability of curve fitting, stimulus-size-response functions were interpolated from smallest to largest stimulus size (2 μm intervals) using shape-preserving piecewise cubic interpolation. The receptive field center size of the target ROI was then defined as the average of the estimated optimal stimulus sizes from matching of all 20 template ROIs. Responses to ON or OFF stimuli were rejected if their maximal amplitude was <25% of the OFF or ON responses, respectively. A size selectivity index of 1 indicates the ROI selectively responds to the smaller stimulus (diameter: 100 μm), whereas a index of −1 indicates the ROI selectively responds to the larger stimulus (diameter: 400 μm). ON and OFF responses were analyzed separately. To analyze how spatial information is encoded in population activity of the VG3-AC plexus (Figure 3), we presented vertical bars at different positions along the horizontal axis of a rectangular imaging region (see Visual stimulation). We plotted responses of each pixel as a function of horizontal bar position and fit the relationship with a Gaussian function to estimate the pixel’s receptive field position along the horizontal axis. Pixels with receptive field positions > 50 μm outside the image region were rejected (6.9% of all pixels were rejected). where x is the predictor (i.e. the receptive field position of a pixel), P(x) is the prior probability of the predictor, c is the class, P(c) is the prior probability of the class (i.e. the assigned bin of a pixel), P(x|c) is the likelihood of predictor given the class, and P(c|x) is the posterior probability of the class given the predictor. All the probability distributions in the naive Bayes classifier were assumed to be Gaussian distributions. To allow for unbiased estimations with unequal numbers of the pixel from each bin, we resampled the data of each bin to match the bin with the maximum pixel number. Thus, the posterior probability learned by the model directly reflects the likelihood, which is equal to the probability distribution of the receptive field positions in the bin. To measure the accuracy of model predictions, data were split randomly into training and testing sets, and tests performed 100 times. The accuracy of model predictions was then measured as the average of percentage of correct predictions across all 100 splits and tests. To make sure that the model reflects the separation of spatial distributions, we shuffled the receptive field positions between bins for classification, which consistently resulted in the chance level of prediction accuracy. Because VG3-AC neurite processing domains contain more than one pixel (median ROI size: 10 pixels), we tested how prediction accuracy changed when more than one pixel contributes to learning the relationship between image location and receptive field position. A local motion preference index of 1 indicates that the respective ROI responded only to local and not to global motion. According to previous studies and the GCaMP6f signals in our experiments, neurites of VG3-ACs stratify between 20% and 60% of IPL depth. In our analyses, we binned ROIs into six different depths with equally spaced boundaries from 18% to 62% of IPL depth, encompassing the complete depth of the VG3-AC plexus. In all figures, the depth of each binned data set is given as the average depth of all ROIs within the defined boundaries across all experiments included in the data set. We acquired functional imaging data from retinas of 17 mice. All summary data and response traces are presented as mean ± SEM. Differences between receptive field center size and transience of ON and OFF responses were statistically examined by Wilcoxon rank sum tests. Tests at different IPL depths were corrected by the Benjamini-Hochberg procedure for multiple comparisons. Depth-dependent differences for polarity and local motion preference indices were tested by Kruskal-Wallis one-way ANOVA, and the paired-group sample-median comparisons were corrected by the Tukey-Kramer method for multiple comparisons. Annual Review of Vision Science 1:263–289. Annual Review of Vision Science 3:1–24. Journal of Comparative Neurology 468:251–263. The Journal of Neuroscience 37:610–625. The Journal of Comparative Neurology 477:386–398. Annual Review of Neuroscience 28:503–532. Frontiers in Neural Circuits 8:104. Physica A: Statistical Mechanics and its Applications 400:159–167. Thank you for submitting your work entitled "Local processing of visual information in neurites of VGluT3-expressing amacrine cells" for consideration by eLife. Your article has been evaluated by a Senior Editor and three reviewers, one of whom is a member of our Board of Reviewing Editors. The following individual involved in review of your submission has agreed to reveal their identity: Thomas Euler (Reviewer #3). Our decision has been reached after consultation between the reviewers. Based on these discussions and the individual reviews below, we regret to inform you that your work will not be considered further for publication in eLife. We would, however, be happy to reconsider the paper If you can add new data along the lines suggested in the consensus review below. The reviewers all appreciated the importance of the main question asked here – the degree to which signals are locally processed in neural processes. Both the individual reviews and the discussion among reviewers, however, emphasized that the general significance of the paper could be enhanced considerably, and that this was important for the results to be appreciated by a broad readership. Suggested extensions of the work could be establishing a clearer role for local processing in these amacrine cells in retinal function, or more direct measures of signals in the neurites of individual (presumably sparsely labeled) amacrine cells. More detailed receptive field measurements may help with this. Details on these points are below in the individual reviews. The issue of localized processing in neurons is interesting and important, and is increasingly accessible with advances in genetically-encoded indicators and imaging techniques. This paper exploits these advances to study signals in the neurites of an unusual amacrine cell type. I have no technical concerns about the paper. The experiments appear well done and appropriately controlled and the writing is clear. I do have concerns about the general significance of the work. Specifically, while the paper shows that signals in different neurites can be distinct, it does not tackle either the origin of these differences or their implications for the synaptic output. I think a connection to either inputs or outputs is important for the paper to be appreciated by a broad readership. Localized processing vs. localized signaling. The paper has three main results: (1) the ratio of On and Off signals in different neurites differs; (2) different neurites are tuned to different stimulus sizes; (3) neurites are similarly tuned for local vs global motion. The first of these results is expected from the known organization of the inner plexiform layer. The other two could indicate differential and local processing in the amacrine neurites, or could already be present in the inputs to the cell. The VGluT-3 amacrines are unusual in using two different transmitters and providing different inputs to downstream targets. The results in the paper are suggestive in this regard – i.e. that localized signaling in the neurites gives rise to local control of the different outputs. Exploring such a connection would greatly enhance the general significance of the paper. Hsiang et al. study the visual response properties of neurite segments of VGluT3-expressing amacrine cells (VG3 ACs) using two-photon calcium imaging. They find that calcium responses in neurites differ as a function of depth within the inner plexiform layer (IPL): neurites that prefer negative contrast stratify nearer to the inner nuclear layer (INL) whereas those that prefer positive contrast stratify further away from the INL. The authors also find that OFF and ON responses differ in their apparent receptive field center diameters at most IPL depths tested. Finally, they find that most VG3 AC neurites respond strongly to local but not global motion stimuli. The extent to which neurons process stimuli locally or globally is an important outstanding problem. However, this short paper would greatly benefit from additional data to sufficiently support the central claim concerning the locality of integration in VG3 AC neurites. 1) One criticism is that the study is relatively descriptive and does not yield insights into a particular retinal circuit. In this way it differs from the previous studies on starburst amacrine cells and A17 amacrine cells, which yielded specific insights into the direction-selective and rod bipolar cell circuits, respectively. 2) The study would be more powerful if the authors could analyze single VG3-ACs, by sparse genetic labeling, dye loading single cells, etc. This was the method used by Euler et al. and Grimes et al. in their studies of AC dendrites. Otherwise, it is difficult to know whether the distribution of response properties reflect differences between cells or differences between neurites within a cell. 3) One of the main findings is that contrast polarity differs with IPL depth (Figure 2D). But this measurement was made with a particular spot size (50-um radius), and the contrast response depends on spot size (Figure 3C). The results in Figure 2D would apparently differ depending on the spot size chosen and there might be little effect if the optimal size for ON and OFF response was used in this calculation. The authors should justify their decision to compute contrast preference using a single spot size and/or supplement this analysis by considering the maximal responses to optimal spot sizes. 4) The measurement of center size was difficult to understand and should be illustrated clearly. The data in Figure 3C did not seem to match the example traces in Figure 3A (unless possibly if center size switched from radius to diameter between panels). For example, the ON center size in Figure 3C at 34% depth is ~100, but the response at 100 μm (radius) in Figure 3C is negligible. Hsiang and co-workers studied dendritic signalling in VGluT3 positive amacrine cells in the mouse retina. VGluT3 amacrine cells are unusual as they use glutamate as well as glycine as transmitters. In a series of recent studies – including ones from the Kerschensteiner lab – these amacrine cells were shown to be involved in several retinal circuits, all dealing with different aspects of visual motion. Hsiang et al. utilize a transgenic line in which VGluT3 amacrine cells express a calcium biosensor. Using two-photon calcium imaging, they record light-evoked signals in the dendrites of these cells in different depths of the inner plexiform layer (IPL). Hsiang and co-workers experimentally confirm what has been proposed based on earlier studies: That the activity in VGluT3 dendrites is highly local, representing the basis for providing signals tailored to the different ganglion cell circuits VGluT3 cells tap into. The authors show that dendritic VGluT3 signals differs in their preference to stimulus polarity (light-ON vs. light-OFF responses), reflecting the IPL depth of the recorded dendritic structures (and the polarity of the respective bipolar cell inputs). In addition, ON and OFF responses differed in their time course (transience) as well as in the stimuli size they preferred. Independent of these differences, all dendritic structured responded consistently to local but not global visual motion. These findings are important as they add a crucial piece to our knowledge about this peculiar amacrine cell; a cell that basically serves as a central "hub" for undirected motion signals in the retina. This is a very thoroughly conducted study and a well written and illustrated manuscript. I have only a few comments and suggestions. Results and Discussion, third paragraph: I had problems parsing this section. The authors wrote "variations in response centre size between ROIs were correlated for ON and OFF responses". From the respective figure, I assume that the authors mean that the ratio between preferred stimulus sizes for ON and OFF response components is more or less consistent across the different IPL depths? If so, this could be clarified in the text. I am surprised that the authors used spots of different sizes and a rather complicated method to extrapolate preferred stimulus size instead of using some kind of noise stimulus and event-triggered averaging to estimate receptive fields. Such an approach may have also allowed to characterize the shape of the receptive fields and the relative position of the ROI within the receptive field. This could tell something about how the dendritic subunits are spatially organised in a particular IPL depth. Have the authors considered/tested this possibility? Thank you for submitting your article "Local processing in neurites of VGluT3-expressing amacrine cells differentially organizes visual information" for consideration by eLife. Your article has been favorably evaluated by Richard Aldrich (Senior Editor) and three reviewers, one of whom, Fred Rieke (Reviewer #1), is a member of our Board of Reviewing Editors. The following individual involved in review of your submission has agreed to reveal their identity: Timm Schubert (Reviewer #3). All of the reviewers appreciated the new experiments and analyses and felt this version of the paper was substantially improved over the previous version. The reviewers also all agreed that the paper makes an important contribution to our understanding of neural signaling. There are a few important issues outstanding, as detailed in the individual reviews below. This is a revised version of a paper using calcium imaging to study processing in the neurites of an unusual amacrine cell type. The paper provides interesting insights into the locality of processing in these cells; the study is particularly interesting given the unique role of these cells in retinal processing and their known outputs to several quite different ganglion cell types. Figure 3 and associated conclusions. I found several aspects of the experiments and analysis of this figure hard to follow. First, the temporal sequence of the experiment was hard to follow. The text describes the bars as being presented in random sequence. But that made panel B confusing – are these concatenated sections of responses to each bar position? Generally a more complete description of the timing of the data collection would be helpful. Second, the aim of the analysis of positional coding was not clear. One issue would be the precision of the mapping of position to neurites. I think the data collected and the analyses presented are appropriate for that question. Another is the representation of positional information. That question would require information about the noise in the responses that limits the coding accuracy. Thus I do not think the data presented supports the conclusion reached in the fourth and last paragraphs of the Results and Discussion. The authors have performed additional experiments and addressed most of the major concerns with the initial submission. Their major claim, that VGluT3 amacrine cells process signals locally within their dendritic trees, seems to be sound. With that said, there are a few moderate concerns that could be cleared up. 1) The authors added Ca imaging from two individual cells. The results show some difference in response polarity between inner and outer dendrites, but the difference is certainly small for one of these two cells compared to the population data. The difference between the two cells, in the On/Off polarity vs. depth analysis, yielded p values that were < 0.05 or < 10^-8. This is a striking difference. It raises a concern with the p < 10^-8 result. This extreme level of significance must be based, in part, on analyzing many small ROIs (yielding a very large n) that are not necessarily independent of one another. This brings up a more significant concern that this process was repeated throughout the paper, leading to the extremely high p values for many of the analyses. I hesitate to bring up such a concern at this point. But it seems necessary to justify the calculation of n (which is linked to the p values) related to the issue of independence between neighboring ROIs in imaging data. 2) It was not clear how the authors confirmed the absence of GCaMP6f+ ganglion cells after the nerve crush procedure. Did they identify a lack of ganglion cell bodies by looking for cells with an axon and not finding them? Or did they stain for ganglion cell markers and show an absence of cells that way? In their manuscript, Jen-Chun Hsiang and colleagues investigate the (subcellular) function of the vGLUT3 amacrine cell, an amacrine cell type that has gained considerable attention in the last five years and plays an important role in the retinal circuits underlying object motion and direction selectivity. The innovative aspect in the work lies in the experimental approach to understand local calcium signaling along the vertical axis of the amacrine cell dendritic tree. This manuscript therefore fills an important gap in our understanding of the underlying mechanisms generating object motion. To this end, subcellular 2-photon calcium imaging in combination with light stimulation was performed in a transgenic mouse line expressing a calcium biosensor in vGLUT3 cells. They found that ON and OFF signals are confined to separate parts of the dendritic arbor and, therefore, may be relayed to distinct postsynaptic ganglion cells. The manuscript is well written; Data are adequately shown in the figures; the supplemental figures provide background information. Detailed information about sample sizes, p-values and statistical testing is provided. In particular, a number of control experiments are very thoughtfully conducted and appreciated. For example, optical nerve crush experiments to exclude the contribution of calcium sensors expressed by OFF-ganglion cells and Oregon Green BAPTA 1 measurements to assess whether the contrast preference reflects differences between individual cells. For spectral stimulation, a wavelength of 385nm was used in the ventral, S-opsin dominated retina to avoid bleed through in the GcAMP6 channel. This reviewer has no major concerns and supports publication. We thank the reviewer for her/his positive remarks about the importance of the question we addressed and the technical quality of our study. We appreciate the concerns raised about the significance of our findings. To address these concerns and to provide further insights into the origins and implications of local processing of visual information in VG3-AC neurites, we have performed a number of additional experiments and rewritten our manuscript. We outline our new results and changes to the manuscript as they relate to the origins and implications of local visual processing, respectively, in our responses to the following two points. Our revised study has four main results: (1) the ratio of ON and OFF signals varies among VG3-AC neurites as a function of their stratification depth; (2) ON and OFF responses differ in their receptive field sizes independent of stratification depth; (3) signal spread in VG3-AC neurites is limited and stimulus positions are encoded with high accuracy in the population activity of the VG3-AC plexus; (Behrens et al., 2016) VG3-AC neurites show uniform object motion sensitivity. We describe our insights into the origins of these four results below and in the Results and Discussion section our revised manuscript. Re (1): Because VG3-Cre mice sparsely label retinal ganglion cells (RGCs), we wanted to make sure that the observed variation in ON and OFF signals reflected the activity of VG3-ACs. For our revisions, we performed two-photon imaging experiments three weeks after optic nerve crush, which selectively removes a large fraction of RGCs (Park et al. 2008). The ratios of ON and OFF signals in these experiments were indistinguishable from those observed in control retinas, confirming that depth-dependent changes in contrast preferences reflect the activity of VG3-ACs. We show results from optic nerve crush experiments in a new figure supplement (Figure 1—figure supplement 4). Because the arbors of each VG3-AC span the depth of the VG3-AC plexus, it seemed unlikely that the shift in contrast preferences reflected differences between cells. Nonetheless, we filled individual VG3-ACs with the Oregon Green BAPTA-1 via patch clamp electrodes, confirming that polarity indices shift within arbors of single cells. We include results from these experiments in Figure 1 of our revised manuscript. Because the ratio of ON and OFF signals in VG3-AC neurites closely follows the stratification patterns of ON and OFF bipolar cell axons in the inner plexiform layer (IPL), we conclude that local bipolar cell innervation patterns determine contrast preferences of VG3-AC neurites with limited vertical integration of visual information in their arbors. Re (2): To map receptive fields more precisely than in our initial submission, we performed 13 new imaging experiments, in which we presented additional stimulus sizes and used a template-fitting algorithm (s. Materials and methods) to measure receptive field sizes. The results from these experiments, which are presented in Figure 2 of our revised manuscript, show that ON receptive fields of VG3-AC neurites are consistently larger than OFF receptive fields, independent of stratification depth. Because ON and OFF receptive field sizes differ within the same neurite, we conclude that these differences originate presynaptically, likely reflecting input from different bipolar cell types. Furthermore, both ON and OFF receptive fields were smaller than VG3-AC arbors, indicating that activity in each neurite is dominated by local input from few bipolar cells with limited lateral integration of visual information. Re (3): As in most parts of the nervous system, synaptic communication of ACs occurs in dense neuropils, in which arbors of neighboring cells overlap extensively. Population coding in sensory and motor systems has been studied at the level of cell bodies, but how information is organized in population activity in neuropils has not been explored. In the IPL, arbors of approximately seven cells overlap at any point of the VG3-AC plexus (Kim et al. 2015). To provide further insights into the origins and significance of local visual processing in VG3-AC neurites, we wanted to determine how spatial information is encoded the population activity of the VG3-AC plexus. If overlapping neurites of different VG3-ACs receive input from different bipolar cells and/or if signals spread far within arbors, the VG3-AC plexus at any point should contain diverse receptive fields. As a result, the accuracy of stimulus-position-encoding in the population activity would be low. On the other hand, if overlapping neurites of different VG3-ACs receive input from the same bipolar cells and information does not spread far within arbors, receptive fields at any point of the VG3-AC plexus should be uniform and stimulus positions should be encoded with high accuracy in the population activity. To distinguish between these possibilities, we imaged rectangular regions (height: 12.8 μm, width: 100 μm) of the IPL in VG3-Cre Ai148 mice while presenting vertically oriented bars (height: 60-80 μm, width: 50 μm) at different positions (interval: 25 μm, range: 800 μm) along the horizontal axis of the imaging regions. This revealed that receptive fields at any point of the VG3-AC plexus are uniform and that stimulus positions are encoded with high precision in the population activity. Together with findings discussed in Re (1) and Re (2), this argues that information spread within VG3-AC neurites is limited. In addition, it suggests that overlapping neurites of different VG3-ACs receive input from the same bipolar cells. These are, to our knowledge, the first experiments to explore population coding in a neuropil. They reveal that local presynaptic innervation patterns rather than by postsynaptic identity can determine the organization of visual information. The results from these experiments are presented in a new Figure (Figure 3) in our revised manuscript. Re (Behrens et al., 2016): We observe uniform object motion sensitive responses in all VG3-AC neurites. Previous studies from our group showed that VG3-AC responses to global motion are suppressed by inhibitory input from GABAergic wide-field amacrine cells and that VG3-AC responses to local motion are driven by rectified input from bipolar cells (Kim et al. 2015 and Kim et al. 2017). However, it remained unclear whether responses to local motion require convergence of ON and OFF bipolar cells. 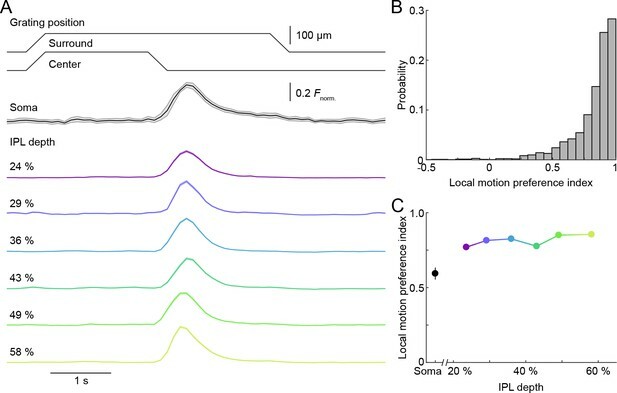 Our finding that even VG3-AC neurites with strongly biased polarity (polarity index ~ 1 or ~ -1) respond robustly to local motion reveals that object motion sensitive responses are generated independent of ON-OFF convergence (Figure 4). Following the reviewer’s suggestion, we have tried in our revisions through additional experiments, analyses, and in rewriting to clarify the implications of local processing of visual information in VG3-AC neurites for their output signals to and the function of different RGC targets. We outline our insights here and describe them in the Results and Discussion section of our revised manuscript. VG3-ACs form glutamatergic synapses with W3-RGCs (Lee et al. 2014, Kim et al. 2015, and Krishnaswamy et al. 2015). Excitatory input from VG3-ACs is required for object motion sensitive responses of W3-RGCs (Kim et al. 2015). W3-RGCs respond to stimuli in a small area of visual space closely aligned with their dendrites. The arbors of VG3-ACs and W3-RGCs are similar in size. Thus, if VG3-ACs were to integrate visual information globally, the receptive fields of W3-RGCs would extend considerably beyond their own dendrites, lowering the precision with which the positions of moving objects could be inferred from their activity. In imaging experiments performed for our revisions (s. response to previous comment and Figure 3 of our revised manuscript), we find that receptive fields at any point of the VG3-AC plexus are restricted to a narrow region of visual space. This limited lateral integration (i.e. local visual processing), enables the dense VG3-AC plexus (coverage: ~7) to provide spatially precise object motion sensitive excitatory input to W3-RGCs without distorting the receptive fields of this size-selective target. In addition to W3-RGCs, VG3-ACs provide glutamatergic input to ON direction-selective ganglion cells (ON-DSGCs), ON-OFF DSGCS, and OFFα-RGCs. These motion sensitive RGC types differ in their preferred stimulus contrast and stratify their dendrites accordingly. We find that VG3-AC neurites exhibit different contrast preferences at different IPL depths (Figure 1). This limited vertical integration (i.e. local visual processing), allows VG3-ACs to provide motion sensitive excitatory input to diverse RGC targets without interfering with their characteristic contrast responses. VG3-ACs form glycinergic synapses with Suppressed-by-Contrast RGCs (SbC-RGCs) (Lee et al. 2016 and Tien et al. 2016). When VG3-ACs were removed from the retina, inhibitory input to SbC-RGCs was reduced selectively for OFF, but not ON stimuli (Tien et al. 2016). The local processing of ON and OFF signals we observe in VG3-AC neurites could account for this selective deficit. We agree with the reviewer that it would be interesting to know if the VG3-AC neurites that provide excitatory and inhibitory output differ in their visual information. We are currently pursing sequential two-photon imaging and electron microscopic circuit reconstruction experiments to address this question. We hope that the reviewer agrees that this effort is beyond the scope of our current study. Together, our results on local visual processing explain how the dense VG3-AC plexus can distribute spatially precise object motion signals to different RGC types without distorting receptive fields and contrast preferences of these diverse targets. Our findings highlight the importance of studying neuronal computations at a subcellular level and the organization of information at a population level. We hope the reviewer agrees that our findings are of interest to a broad neuroscience audience. […] The extent to which neurons process stimuli locally or globally is an important outstanding problem. However, this short paper would greatly benefit from additional data to sufficiently support the central claim concerning the locality of integration in VG3 AC neurites. We thank the reviewer for her/his positive remarks about the importance of the question addressed in our study and its main findings. Following the reviewer’s suggestions, we have performed a series of additional experiments to further test the locality of integration in VG3-AC neurites and to address other specific comments. We will briefly summarize results that support local visual processing here, and described them in more detail in our responses to subsequent comments of the reviewer and in our revised manuscript. 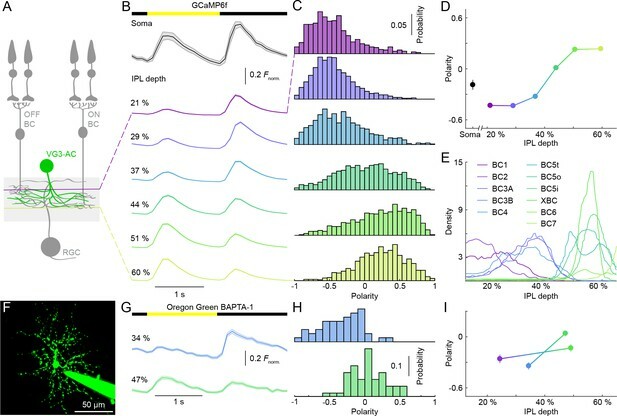 (1) For our revisions, we imaged activity in individual VG3-ACs filled with Oregon Green BAPTA-1, confirming that the ratio of ON and OFF responses differs between neurites of a single cell at different IPL depths (i.e. limited vertical integration of visual information). (2) By mapping receptive fields at higher resolution, we find that ON and OFF receptive fields in VG3-AC neurites are smaller than VG3-AC arbors, indicating that activity of each neurite is dominated by local input from few bipolar cells (i.e. limited lateral integration of visual information). (3) At any point of the VG3-AC plexus, neurites from approximately seven cells overlap. To understand how visual information is encoded at a population level, we presented a new stimulus and analyzed the distribution of receptive field positions in the VG3-AC plexus. This revealed continuous topographic maps, which encode stimulus positions with remarkable precision. These maps further supports the notion that lateral integration of visual information is limited and explain how the dense VG3-AC plexus can contribute spatially precise signals to diverse RGC targets without distorting their receptive fields. We thank the reviewer for this comment. We performed additional experiments to clarify the diversity of contrast processing in VG3-AC neurites (s. responses to points 2 and 3) and to map their receptive fields in more detail (s. responses to points 3 and 4). We also designed a new stimulus to determine the accuracy with which stimulus positions are encoded at population level in the VG3-AC plexus (s. Figure 3). Results from these experiments helped clarify how local visual processing in VG3-AC neurites likely contributes to the function of specific retinal circuits. Here, we briefly outline our insights, which are presented in the Results and Discussion section of our revised manuscript. VG3-ACs provide excitatory input to W3-RGCs (Lee et al. 2014, Kim et al. 2015, and Krishnaswamy et al. 2015). The input from VG3-ACs is required for object motion sensitive responses of W3-RGCs, which detect movement in a small area of visual space closely aligned with their dendrites (Zhang et al. 2012 and Kim et al. 2015). The arbors of VG3-ACs and W3-RGCs are similar in size. If VG3-ACs were to integrate visual information globally, the receptive fields of W3-RGCs would extend considerably beyond their own dendrites, lowering the precision with which the position of moving stimuli could be inferred from their activity. In imaging experiments performed for our revisions (Figure 3), we find that although arbors of neighboring VG3-ACs overlap extensively (coverage: ~7), receptive field positions in the VG3-AC plexus form continuous remarkably precise maps of visual space. Thus, local processing of visual information (i.e. limited lateral integration), enables the dense VG3-AC plexus to provide object motion sensitive excitatory input to each W3-RGC without distorting its receptive field and without lowering the spatial resolution of object motion detection in the retina. In addition to W3-RGCs, VG3-ACs provide excitatory input to ON direction-selective ganglion cells (ON DSGCs), ON-OFF DSGCS, and OFFα-RGCs. These motion sensitive RGC types differ in their preferred stimulus contrast and stratify their dendrites accordingly. We find that VG3-AC neurites exhibit different contrast preferences at different IPL depths (Figure 1). Thus, local processing of visual information (i.e. limited vertical integration), allows VG3-ACs to provide motion sensitive excitatory input to diverse RGC targets without interfering with their characteristic contrast coding. VG3-ACs form glycinergic synapses with Suppressed-by-Contrast RGCs (SbC-RGCs) (Lee et al. 2016 and Tien et al. 2016). When VG3-ACs are removed from the retina, inhibitory input to SbC-RGCs is reduced selectively for OFF, but not ON stimuli (Tien et al. 2016). The local processing of ON and OFF signals in VG3-AC neurites we observe in our imaging experiments could account for this selective deficit. Together, our findings on local visual processing explain how the dense VG3-AC plexus can contribute spatially precise object motion sensitive signals to diverse RGC types without interfering with target-specific contrast preference and receptive fields. The arbors of each VG3-AC span the depth of the VG3-AC plexus (Grimes et al. 2011, Kim et al. 2015); and the distributions of polarity indices in the outer and inner parts of the plexus show little overlap (s. Figure 1). Thus, is seemed unlikely that the depth-dependent shift in polarity indices reflects differences between VG3-ACs. Nonetheless, following the reviewer’s suggestion and the examples of Euler et al. and Grimes et al., we filled individual VG3-ACs with Oregon Green BAPTA-1 via patch clamp electrodes. Single cell imaging experiments confirmed that the layer-specific differences in response polarity (i.e. ON vs. OFF) observed at a population level in VG3-AC neurites reflect differences between the neurites of individual cells rather than differences between cells. We show the results of single cell imaging experiments in Figure 1 of our revised manuscript. We thank the reviewer for raising this important point. To characterize the size preferences of ON and OFF responses in more detail, we performed new imaging experiments in which we presented additional stimulus sizes (s. response to point 4). In this data set, we observed the largest ON responses to spots of 50-μm or 75-μm radius, and the largest OFF responses to spots with 38-μm or 50-μm radius. As a single stimulus size, therefore, spots of 50-μm radius were suited best to illustrate the shift in contrast preferences across VG3-AC arbors with stratification depth (s. Figure 1). However, to make sure that this shift was not restricted to a particular stimulus size, for our revisions, we also calculated polarity indices based on ON and OFF responses across all stimulus sizes. Results from this analysis are shown in a new figure supplement (Figure 2—figure supplement 1) and reveal the same depth-dependent change in contrast preferences observed in responses to spots of 50-μm radius. Note that, following another reviewer’s suggestion, we give the size of stimulus spots and receptive fields in diameter rather than radius in our revised manuscript. For our revisions, we performed 13 new imaging experiments, in which we presented additional spot sizes and measured receptive field center sizes using a template-fitting algorithm (s. Materials and methods). For each ROI (i.e. target), we shifted and scaled (x-axis) stimulus-size-response functions of 20 other randomly chosen ROIs (i.e. templates), to fit responses of the target ROI. We then averaged the optimal stimulus sizes from these matched templates and defined this as the receptive field center size of the target ROI. We present results from these experiments in Figure 2 of our revised manuscript. Previous studies similarly used the stimulus size eliciting the maximal response as a measure of the receptive field center size (e.g. Crook et al. 2008). Before settling on this approach, we tried to fit stimulus-size-response functions with Difference-of-Gaussians models. However, these models fit our data poorly, likely because calcium imaging gives a rectified readout of the membrane potential; and large stimuli, which reliably hyperpolarize VG3-ACs (Lee et al. 2014 and Kim et al. 2015), did not cause a measurable decrease in the GCaMP6f baseline fluorescence (Figure 2). To measure the influence of receptive field surrounds, we calculated a size selectivity index comparing responses to small (diameter: 100 μm) and large (diameter: 400 μm) stimuli, similar to previous studies (e.g. Farrow et al. 2011). Both ON and OFF responses were strongly size selective. We show distributions of size selectivity indices in a new figure supplement (Figure 2—figure supplement 2) in our revised manuscript. […] This is a very thoroughly conducted study and a well written and illustrated manuscript. I have only a few comments and suggestions. We have rewritten this section of the manuscript to clarify our results on receptive field sizes. We have performed new imaging experiments in which we presented additional stimulus sizes and used a template-fitting algorithm to measure receptive field sizes (s. response to next point). Our new results confirm, as the reviewer notes, that ON receptive fields of VG3-AC neurites are larger than OFF receptive fields, independent of the stratification depth. The observation of consistent differences between ON and OFF receptive fields in the same neurite suggests that these differences originate presynaptically, likely reflecting input from different bipolar cell types. We show results from the new experiments in Figure 2 and describe the algorithm used to measure receptive field sizes in the Materials and methods section of our revised manuscript. Following the reviewer’s suggestion, we tried to map receptive fields using binary white noise stimuli (Baden et al. 2016 and Franke et al. 2017). However, response-weighted stimulus averaging and related approaches did not render well-defined receptive fields. Two factors likely contributed to this. (1) ON and OFF inputs converge on VG3-AC neurites. We tried to separate ON and OFF influences using variations of approaches others and we previously described (Gollisch et al. 2008, Pearson et al. 2015). While these approaches can work, they require more data and tend to be less robust than averaging is for purely ON or OFF responsive cells. (2) VG3-ACs receive strong surround inhibition driven by rectified receptive field subunits (Lee et al. 2014, Kim et al. 2015). This inhibition is likely recruited by the binary white noise stimulus, suppressing excitatory inputs and the associated calcium transients (s. also the lack of responses to global pattern motion in Figure 4). For our revisions, we performed 13 new imaging experiments, in which we presented additional spot sizes and measured receptive field center sizes using a template-fitting algorithm (s. Materials and methods). For each ROI (i.e. target), we shifted and scaled (x-axis) stimulus-size-response functions of 20 other randomly chosen ROIs, to fit responses of the target ROI. We then averaged the optimal stimulus sizes from these matched templates and defined this as the receptive field center size of the target ROI. We present results from these experiments in Figure 2 of our revised manuscript. Previous studies similarly used the stimulus size eliciting the maximal response as a measure of the receptive field center size (e.g. Crook et al. 2008). Before settling on this approach, we tried to fit stimulus-size-response functions with Difference-of-Gaussians models. However, these models fit our data poorly, likely because calcium imaging gives a rectified readout of the membrane potential; and large stimuli, which reliably hyperpolarize VG3-ACs (Lee et al. 2014 and Kim et al. 2015), did not cause a measurable decrease in the GCaMP6f baseline fluorescence (Figure 2). To measure the influence of receptive field surrounds, we calculated a size selectivity index comparing responses to small (diameter: 100 μm) and large (diameter: 400 μm) stimuli, similar to previous studies (e.g. Farrow et al. 2011). Both ON and OFF responses were strongly size selective. We show distributions of size selectivity indices in a new figure supplement (Figure 2—figure supplement 2) in our revised manuscript. Our new measurements of receptive field center sizes show, consistent with our previous results, that in VG3-AC neurites ON receptive fields are larger than OFF receptive fields. Furthermore, both ON and OFF receptive fields are smaller than VG3-AC arbors, indicating that activity of each neurite is dominated by local input from few bipolar cells (i.e. limited lateral integration of visual information). To address the reviewer’s question how neurite subunits are organized in the VG3-AC plexus, in which neurites from approximately seven cells overlap at any point (Kim et al. 2015), we imaged activity in rectangular regions (height: 12.8 μm, width: 100 μm) while presenting vertically oriented bars (height: 60-80 μm, width: 50 μm) at different positions (interval: 25 μm, range: 800 μm) along the horizontal axis of the imaging region. We found that at any point of the VG3-AC plexus receptive field positions were uniform. This further supports the notion that lateral integration of visual information is limited, suggests that overlapping neurites from different VG3-ACs receive input from the same bipolar cells, and explains how the dense VG3-AC plexus can contribute spatially precise object motion signals to different RGC targets without distorting their receptive fields. Results from these experiments are presented in a new Figure (Figure 3) in our revised manuscript. […] Figure 3 and associated conclusions. I found several aspects of the experiments and analysis of this figure hard to follow. First, the temporal sequence of the experiment was hard to follow. The text describes the bars as being presented in random sequence. But that made panel B confusing – are these concatenated sections of responses to each bar position? Generally a more complete description of the timing of the data collection would be helpful. The reviewer is correct. The bars were shown in random sequences and responses reordered by stimulus positions in panel B to more clearly present the salient information. We have added statements clarifying this and provided further information on stimulus timing (duration of bar presentation [1.5 s] and stimulus intervals [1.5 s]) in the Results section and in the legend of Figure 3. Second, the aim of the analysis of positional coding was not clear. One issue would be the precision of the mapping of position to neurites. I think the data collected and the analyses presented are appropriate for that question. Another is the representation of positional information. That question would require information about the noise in the responses that limits the coding accuracy. Thus I do not think the data presented supports the conclusion reached in the fourth and last paragraphs of the Results and Discussion. We thank the reviewer for pointing this out. We agree that our analysis captures the precision with which visual space is mapped onto the VG3-AC plexus, but does not allow us to make inferences about the precision with which stimulus positions can be inferred from the activity of the VG3-AC plexus. As suggested, we have rewritten the sentences highlighted by the reviewer and a sentence in the Abstract. […] With that said, there are a few moderate concerns that could be cleared up. 1) We observed no differences in local motion preference indices as a function of IPL depth nor between the transience of ON and OFF responses even though these comparisons involved the same n’s. 2) The effect sizes of differences in polarity indices and receptive field center sizes were quite large, and polarity indices at different IPL depths, ON, and OFF receptive field center sizes formed clearly distinct distributions. 3) To further address the reviewer’s comment, we analyzed polarity indices and receptive field center sizes without image segmentation, using the average activity of each imaging plane as a single data point. This greatly reduced n’s. In spite of this, polarity indices and receptive field center sizes remained significantly different across IPL depth and between ON and OFF responses, respectively. We added the statistics of these comparisons, which follow, to the legends of Figure 1 and 2. Without segmentation, polarity indices differed between IPL depths (p < 10-12, Kruskal-Wallis one-way ANOVA). Activity at 21% and 29% IPL depth was more biased to OFF responses than at other depths (p < 0.05 compared to 44%; p < 10-5 for 51% – 60%). Activity from 51% – 60% IPL depth was more biased to ON responses than from 21% – 29% (p < 10-5), 37% (p <0.01). (21%: n = 15; 29%: n = 18; 37%: n = 14; 44%: n = 16; 51%: n = 23; 60%: n = 20). We added these statistics to the legend of Figure 1. Without segmentation, ON receptive field centers were larger than OFF receptive field centers (p < 10-3, Wilcoxon rank sum test, total: n = 61, 21%: n =6; 29%: n = 13; 37%: n = 7; 43%: n = 6; 50%: n = 12; 60%: n = 17). We added these statistics to the legend of Figure 2. The somata of VG3-ACs are localized exclusively in the inner nuclear layer; and all cells labeled by GCaMP6f in the ganglion cell layer of VG3-Cre Ai148 mice have axons, suggesting that they are RGCs. To assess the loss of RGCs after unilateral optic nerve crush, we compared the number of GCaMP6fpositive somata in the ganglion cell layer of the affected eye three weeks after nerve crush, to the number of GCaMP6f-positive somata in the ganglion cell layer of the other eye. This revealed that optic nerve crush reduced the RGC density by 74%. We describe our analysis and this result in the legend of Figure 1—figure supplement 3. We thank members of the Kerschensteiner lab and Drs. Josh Morgan and Tim Holy for helpful comments and suggestions throughout this study. This work was supported by the National Institutes of Health (EY023341, EY026978, and EY027411 to DK and the Vision Core Grant EY0268) and by an unrestricted grant from the Research to Prevent Blindness Foundation to the Department of Ophthalmology and Visual Sciences at Washington University. Animal experimentation: All procedures in this study were approved by the Institutional Animal Care and Use Committee of Washington University School of Medicine (Protocol # 20170033) and were performed in compliance with the National Institutes of Health Guide for the Care and Use of Laboratory Animals. © 2017, Hsiang et al.